In this paper we consider the controllability problem for hybrid systems, namely that of determining the set of states which can be driven into a given target set. 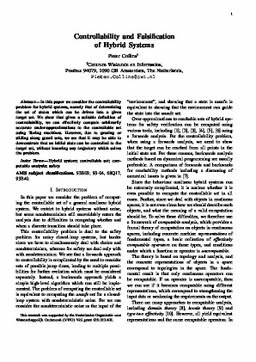 We show that given a suitable de&#64257;nition of controllability, we can effectively compute arbitrarily accurate under-approximations to the controllable set using Turing machines. However, due to grazing or sliding along guard sets, we see that it may be able to demonstrate that an initial state can be controlled to the target set, without knowing any trajectory which solves the problem. Keywords Hybrid system, controllable set, computable analysis, safety. Collins, P.J. (2009). Controllability and Falsification of Hybrid Systems. In J Bokor (Ed. ), Proceedings of the European Control Conference 2009. European Union Control Association.